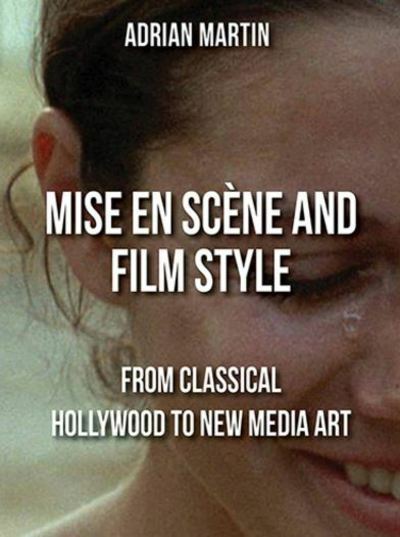 Adrian Martin’s new Mise en Scène and Film Style: From Classical Hollywood to New Media Art is an eagerly awaited book. Martin has been setting the agenda for debates about how to think and write about cinema for several decades. He is the author of countless scholarly essays and books, journalistic articles and reviews, DVD commentaries and a growing number of innovative audiovisual essays made in collaboration with Cristina Álvarez López. This book is a culmination of these decades of writing and thinking about cinema and it is also an extension of them. It is an erudite agenda-setting book; but one of the things that distinguishes it from so many other academic books is that it is also informed by Martin’s lyrical, passionate and engaging cinephilia. Martin’s own extensive research into mise en scène and film style can be traced back to another significant publication – a 1992 issue of Continuum that he edited titled Film – Matters of Style. In this edited collection he brought together many great scholars and important essays, but it is Martin’s own essay there – a seminal essay on mise en scène titled “Mise en scène is Dead, or The Expressive, The Excessive, The Technical and the Stylish” that I want to single out here. It is an exemplary work of scholarship and, for a very long time, it was the best essay on the topic of mise en scène, cinema aesthetics and film criticism that had been written. In fact, in their 2002 methods book Studying Contemporary American Film: A Guide to Movie Analysis, Thomas Elsaesser and Warren Buckland selected this very essay in their chapter on how to approach the work of mise en scène analysis. In the multiple, overlapping histories of film criticism that Martin maps, he poses the question – what is mise en scène exactly – or inexactly? (2) This question takes him from mise en scène’s “theatrical origins” in the 1950s through its various uses and articulations up until the present day. The depth of Martin’s scholarly excavations into this fraught history are evident in his focus on both widely read and acknowledged writers such as V.F Perkins and Robin Wood, but also largely ignored figures such as Gérard Legrand from Positif and his out-of-print 1979 book on film aesthetics, Cinémanie, a book that is important to Martin for a number of reasons. First for its approach to close analysis, second because it is one of many studies where mise en scène came to stand in for film style itself, but lastly because its marginalisation has meant that an important writer has been left out of many histories of film criticism. Martin goes on to discuss the work of writers as diverse and fascinating as Frieda Grafe, Harun Farocki, Nicole Brenez, Shigehiko Hasumi, Guillermo Cabrera Infante, Serge Daney and Raymond Bellour – to mention just a few. There are also many exhilarating and audacious theoretical and critical moves that he makes – linking Paul Willemen’s and Jacques Rancière’s criticism of mise en scène, using propositions formulated by the filmmaker Ritwik Ghatak to discuss sound design, and using Jacques Rivette’s films and criticism to map a trajectory from the heroic age of mise en scène to its reformulations. Martin’s own cinephile passions are woven through the book, but they are most evident in the selection of screen texts that he studies – surprising selections, certainly not part of a conventional canon of screen studies. The book is framed by a prologue and an epilogue that feature compelling close analyses worth buying the book for on their own. The prologue features a close study of a six and three quarter minute sequence from De Palma’s Ballet Russe scene in Passion (2012), and the epilogue features another close study – this time of a scene (five minutes and fifteen seconds) from Ritwik Ghatak’s The Golden Line (1965). The treatment of these sequences are great examples of what very good close analysis can be, as well as providing illustrations of what a conventional mise en scène approach can offer, as compared to one that uses the concept of the dispositif. It is a book that you can read for its revisionist history, or for its polemical passion for cinema; and it is also a book that you can dip into to read insightful studies of sequences from Otto Preminger’s Anatomy of a Murder (1959), Vincente Minnelli’s On a Clear Day You Can See Forever (1970), Miguel Gomes’ Our Beloved Month of August (2008), David Cronenberg’s A History of Violence (2005) and Godard’s Vivre sa vie (1962). But there are equally fascinating studies of television texts such as Breaking Bad (2008-2013), My Big Fat Obnoxious Boss (2004) and Web Therapy (2008-). There are also striking studies of gallery installations such as Emerald (2007) by Apichatong Weerasethakul and Women from Antwerp in November (2008) by Chantal Akerman. Bordwell and Thompson’s Film Art: An Introduction was the preferred textbook for introductory Film courses for years. Although it provides plenty of information about film techniques, it’s not particularly useful when it comes to teaching students about concepts such as genre and authorship, let alone the social and cultural meanings of films. And, despite the formalist approach of its authors, it’s not much help with getting students to writing a piece of film criticism. Scholars and publishers have recognised these limitations (not to mention the financial opportunities) and several alternatives have appeared recently. I think that there is room for at least one more. Adrian Martin is an eclectic, stimulating and hugely knowledgeable writer on film. He has published books on Once Upon a Time in America and the Mad Max trilogy, and countless articles, essays and film reviews. However, Martin has not published a general book on cinema. He’s also expressed some reservations about the teaching of film studies in the university environment. I’d like him to take up the pedagogical challenge of writing a wide-ranging text that encompasses what he regards as the key elements of film studies and how they can be taught (more) effectively. While Martin’s new book may not be the kind of general introductory text book that Groves imagined, it is still an essential book that should be taken into classrooms to inspire and support students in their work of screen analysis. Mise en scène and Film Style: From Classical Hollywood to New Media Art is part of Palgrave’s Close Readings in Film and Television series edited by John Gibbs and Douglas Pye. The brief of this series is to publish books which “will be committed to the appreciation of new areas and topics in the field, but also to strengthening and developing the conceptual basis and the methodologies of critical analysis itself.” Martin’s book more than fulfills this brief, challenging its readers to rethink what mise en scène is, and to explore the more expansive concept of the dispositif. It is a truly generative work which invites and provokes future writing, thinking and dreaming about the cinema in its multiple forms.